At Bingham-Lester Dentistry, we strive to help patients in Crofton, MD and the surrounding areas. One of our goals is to help patients keep their natural teeth. However, there are times when tooth extraction is necessary. 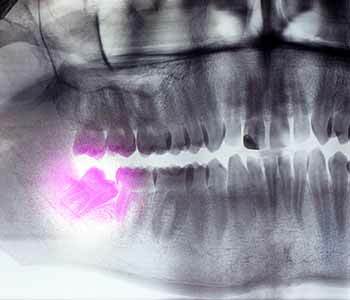 Done for preventative reasons or to address a specific problem, wisdom tooth removal is one of the most commonly performed oral surgeries. If the mouth is too small, the teeth are impacted, or the wisdom teeth are erupting and causing problems, extractions may be recommended. Impacted wisdom teeth can cause swelling and pain. The adjacent teeth may be damaged. Wisdom tooth extractions are performed to protect the health of the mouth. Wisdom teeth are the third and final set of molars we get. They often appear between the ages of 18 and 25. Anthropologically, our ancestors probably had the extra set of teeth due to dietary needs of chewing hard foods. However, our smaller face and jaw sizes today and different dietary lifestyles have led to a decreased need for additional teeth. Since some patients get wisdom teeth without any problems, x-rays are used to check your teeth and monitor for potential issues. If a problem appears, Dr. Bingham-Lester will review your options, including wisdom tooth removal. Using a gentle touch and precise techniques, your teeth are extracted comfortably and quickly. Follow your dentist’s advice after the procedure for a faster recovery and optimal results. If you live near Crofton, MD, contact our Gambrills office to schedule your appointment with Dr. Bingham-Lester today. Call 410-885-6522.